Jeremy Franklin says this news means even credit-challenged customers can find financing to obtain a reliable vehicle. This is very good news, it is so important for most of us to have a car or truck we can depend on," said Franklin. Even though the recession has hit consumers hard, there is some good news for consumers who need to replace a worn-out vehicle. Auto loans are much more attainable now, even for buyers who are credit-challenged. That is good news for the 90 percent of Americans who use financing to buy cars. Lenders have more money to work with and more options on financing, including the ability to lend more per transaction. Average loans are up more than $200 in the past two years. There is also greater competition for loans among financial institutions and that is good news for consumers. Buyers can improve financing options by keeping their credit score at the highest possible level. Getting the best possible rate for a loan based on your credit score allows buyers to gain advantages such as moving up in credit score tiers. Many are actually able to attain a better rate now than their last vehicle purchase because they have worked hard to build their credit score. Before heading out to vehicle shop, make your credit information part of the research process. Coming to the dealership with all the right information will expedite the buying process and give you a realistic view of the kind of financing you should be eligible to receive. Checking credit scores also give consumers a chance to fix credit mistakes that may be hurting their present and future options. Jeremy Franklin Suzuki and Jeremy Franklin’s Used Car Network are award-winning, nationally ranked car dealerships dedicated to maintaining a solid commitment to customer satisfaction, offering the widest selection of vehicles and specializing in ease of purchase. The dealerships are members of the Better Business Bureau and are committed to the highest ethical standards for marketplace conduct. 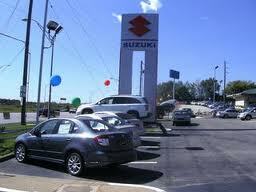 Both dealerships are located at 6300 E. 87th St. (87th Street & I-435), Kansas City, MO 64138. Find them on the Web at http://www.jeremyfranklin.com. Jeremy Franklin Suzuki, Kansas CItyJeremy Franklin Suzuki used cars feature a rigorous 156-point inspection by a certified mechanic.